Theresa May has arrived in Strasbourg for last-ditch talks with senior EU officials aimed at winning MPs' backing for her Brexit deal. She is meeting European Commission President Jean-Claude Juncker on the eve of the second vote on her deal. The BBC's Adam Fleming said EU member states have been told about a "package" the PM and Mr Juncker are considering. It includes a joint statement on the backstop being "temporary" and "ambitions for a free trade agreement". The BBC's Laura Kuenssberg said UK ministers are in the Cabinet Office being briefed on the discussions in Strasbourg. 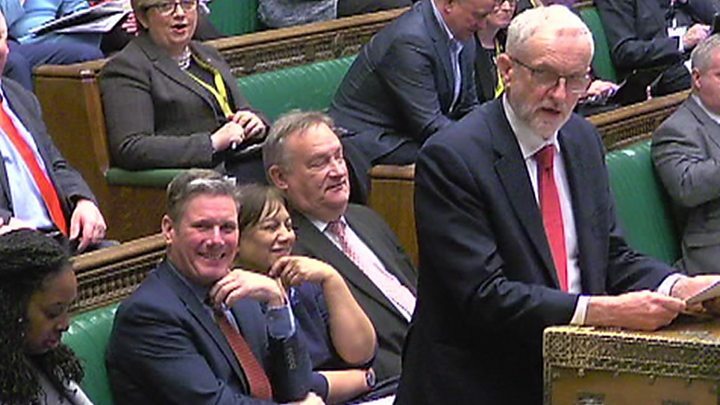 But earlier in the Commons, Labour leader Jeremy Corbyn said there had "not been a single change" to the agreement since it was heavily defeated by MPs in January and it was still a "bad deal". 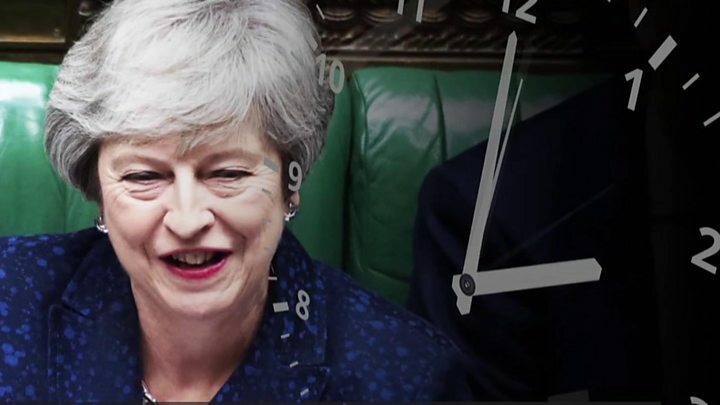 Following speculation the vote could be postponed or downgraded, No 10 said the motion to be debated would be published later on Monday - although it gave no details of what it could contain. Mrs May was greeted on her arrival by both Mr Juncker and the EU's chief Brexit negotiator Michel Barnier. She was joined by Brexit Secretary Stephen Barclay, who had been expected to give a statement on the progress of Brexit to the House of Commons later. It is now thought that Cabinet Office Minister David Lidington will take up the role. 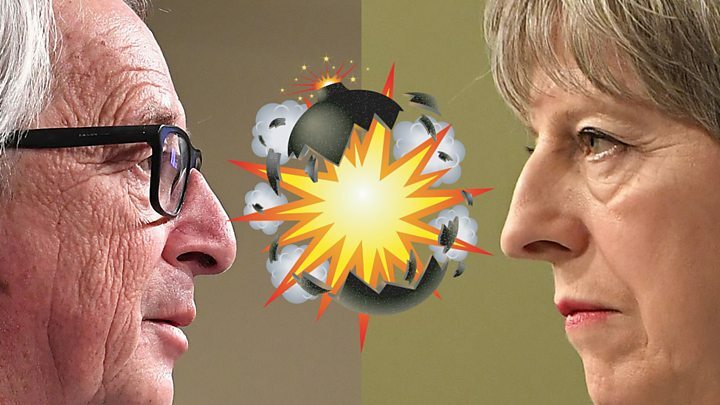 Media captionJeremy Corbyn, on Brexit negotiations: "This is a government in chaos"
BBC Brussels reporter Adam Fleming said EU leaders had been told about a package of options being considered by Mrs May and Mr Juncker in their meeting later. Our correspondent described the mood in Brussels as "bleak" after the EU's chief Brexit negotiator, Michel Barnier, briefed EU ambassadors on the state of play earlier. Member states were told that the UK had rejected the EU's proposed solutions on the backstop because "they wouldn't get the support of the Cabinet", according to our correspondent. President of the European Parliament, Antonio Tajani, confirmed he would also be meeting Mrs May on Monday evening, tweeting that a no-deal Brexit "must be avoided to protect our citizens and safeguard overall stability". In a statement, the Commission said it had put forward proposals to try to reassure MPs the backstop "if used will apply temporarily". A spokesman said the EU was willing to meet UK negotiators at any time and was "committed to ratifying this deal before 29 March". Brexit minister Robin Walker has been updating MPs in response to an urgent question from Labour. He said the government "absolutely stood by" its commitment to hold Tuesday's vote and, if the PM's deal was defeated, subsequent votes by Thursday at the latest on a no-deal exit and extending talks. Details of Tuesday's "meaningful vote" motion will be published by the end of Commons business, expected to be about 22.00 GMT, and the government is due to make a statement before that. Labour MP Pat McFadden said any vote had to be on the Brexit deal, as currently constituted, and not a version of the deal ministers might hope to end up with after further talks with the EU. And Tory Brexiteer Peter Bone urged the government to delay the vote until MPs had had enough time to scrutinise any changes to the deal.